The latest employment numbers from South Korea paint a sobering picture of the current state of youth unemployment. 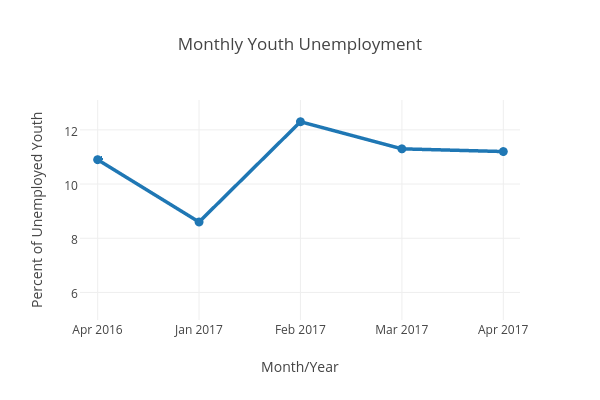 On May 11, Statistics Korea, a South Korean government agency, released their monthly report for April 2017, revealing that youth unemployment in South Korea currently sits at 11.2%, up 0.3% from a year prior. Some outside observers estimate that actual unemployment could reach as high as 23%, if the unemployment rate is recalculated using other countries’ standards. As noted in our previous article, Korean youth are highly educated, with 70.9% of high school graduates attending college. Despite these qualifications, young Koreans — even alumni of the illustrious Seoul National University — find themselves struggling in the current job market. Many youth end up forced to choose between the immediate need to earn an income and their future job prospects. Smaller business firms only pay their employees around two-thirds of the income that a comparable worker at a chaebol would earn; as a result, most young Koreans aspire to working for a chaebol, one of the major business conglomerates like LG or Samsung, in hopes of securing a better future for themselves. This dearth of jobs for youth has far-reaching consequences for the future of Korean society. Youth who are unemployed or underemployed find themselves living with their parents and delaying starting families of their own, as well as missing out on crucial work experience. Of those who do manage to snag a job, many end up working grueling long hours at the beck and call of their bosses, often without receiving any sort of overtime compensation while under threat of being fired; long hours can severely harm family life and factor into decisions whether or not to have children. With Korea’s already-low birth rate, these work-family conflicts exacerbate existing concerns about how Korean society will handle a rapidly aging population. Incoming finance minister Kim Dong-yeon plans to implement more active and expansive government policies to try to combat pervasive youth unemployment, following President Moon Jae-in’s earlier campaign promises with regards to the economic challenges currently facing South Korea. Moon’s strategy is a departure from that of his more conservative predecessor, recently impeached former President Park Geun-hye.